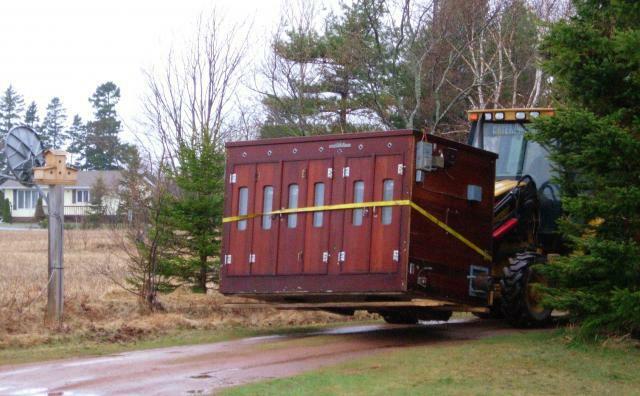 The coop gets delivered. 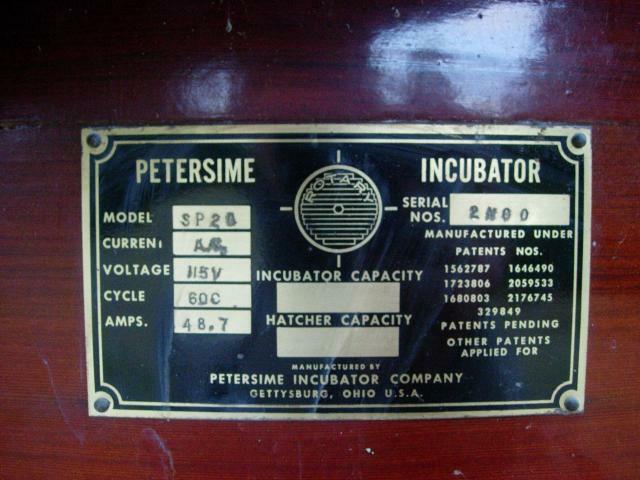 It is/was an old incubator. Bought it, and another MUCH bigger one for $50 each. Cost $75 each to have them moved 3 miles to our house.They are made of 3.5 inch thick Redwood!! 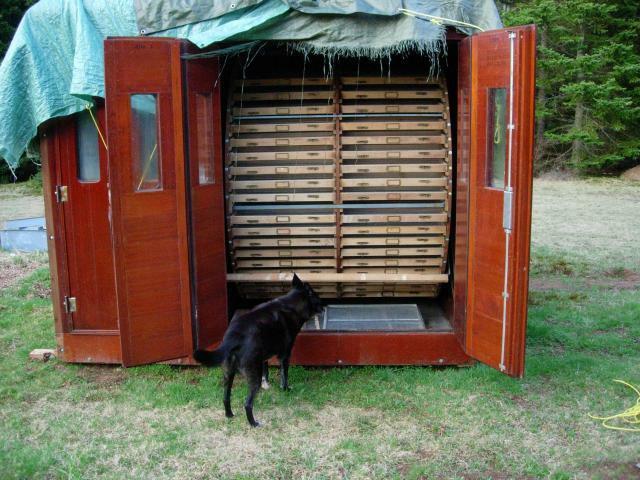 Bart (the Border Collie) checks out the egg trays in the larger incubator. We are half way thru turning it into a sauna! We pulled out lots of copper wiring, pipes and such to recycle and make room. 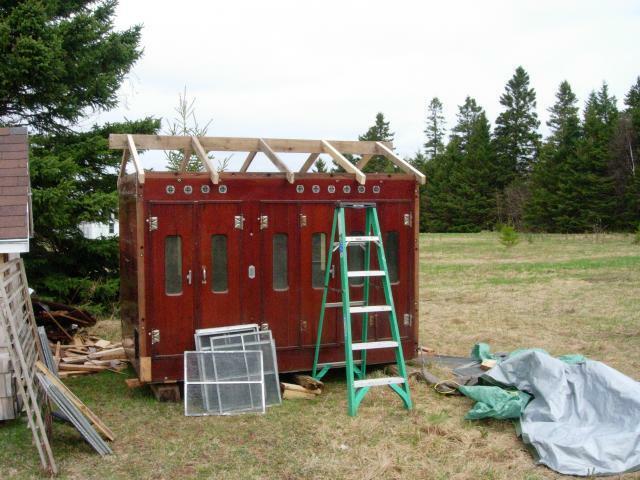 I started out by putting a tin roof on the incubator as the top was flat before. The rows of round vent things are just that-vents. They are also found inside venting thru the roof. The metal "screens" are some of the trays from the "peeps" side of the coop. 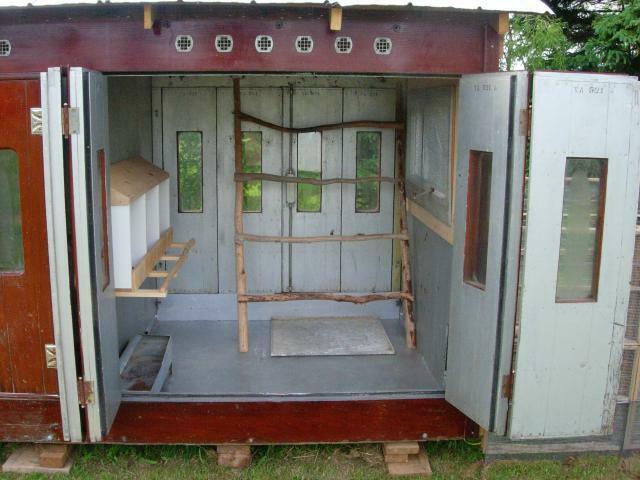 One room (the bigger of the 2) was for the eggs the other for the newly hatched birds. Great storage room on the small side. Tin floor and all! The roof is on but not painted yet. This photo shows the two rooms and all the doors wide open. Great access for cleaning/airing out. Roof painted and all the doors closed. The new $5 yard sale window installed and double screened using the old peep trays. 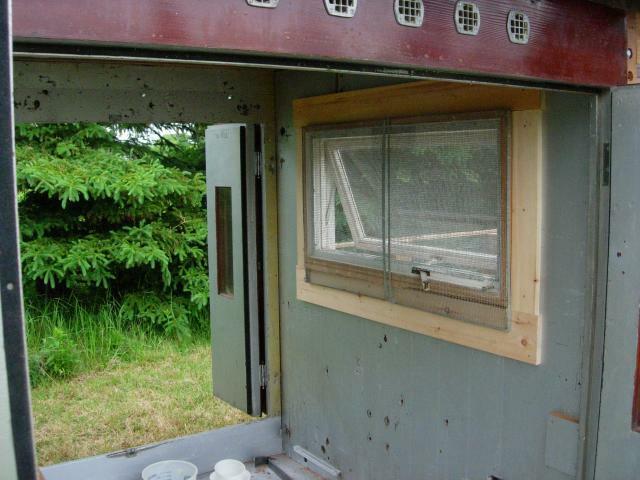 The nest boxes. Made from driftwood (perch) and scrap lumber from other projects. The bottoms are lined with linoleum and will have straw in them. The back is a hinged lid for access from the storage room, that way the girls can stay warm when we collect eggs in the dead of winter. It gets c-c-c-cold here in Prince Edward Island, Canada. 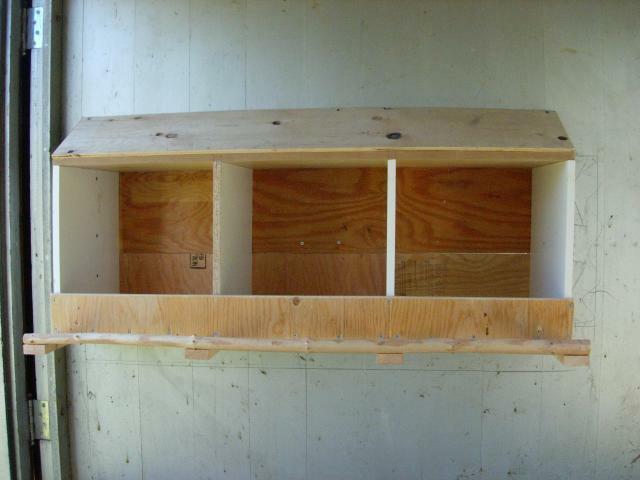 This shows the back of the nest boxes, with the lid closed, in the storage room. 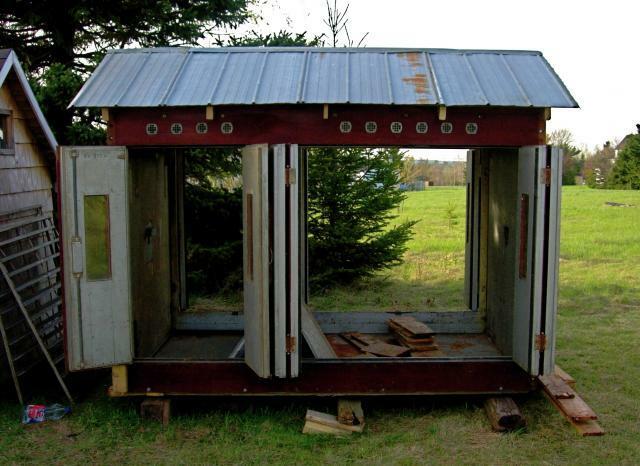 This is the finished coop. I need to hang the feeder and the waterer. The "girls" arrive Tuesday the 23rd of June 2009. 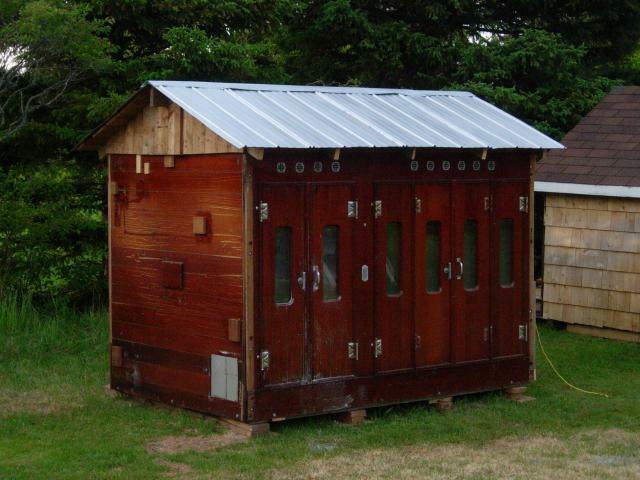 I will add photos of the coop in use when they are old enough to use it. Hope you enjoyed our little recycling project! 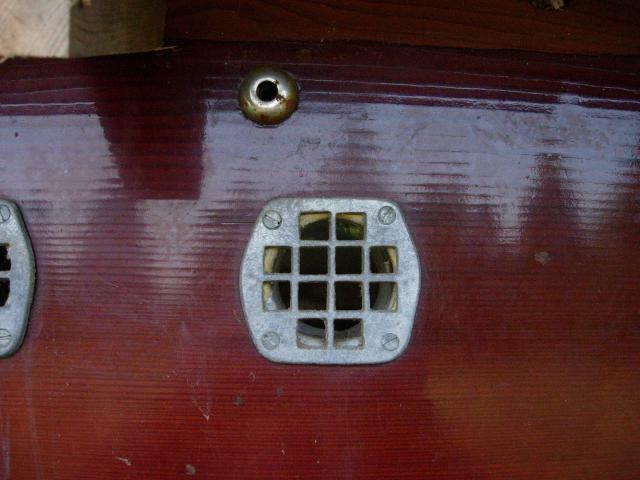 Here is a close up of one of the vents. It has a brass liner and can be completely closed off from inside. 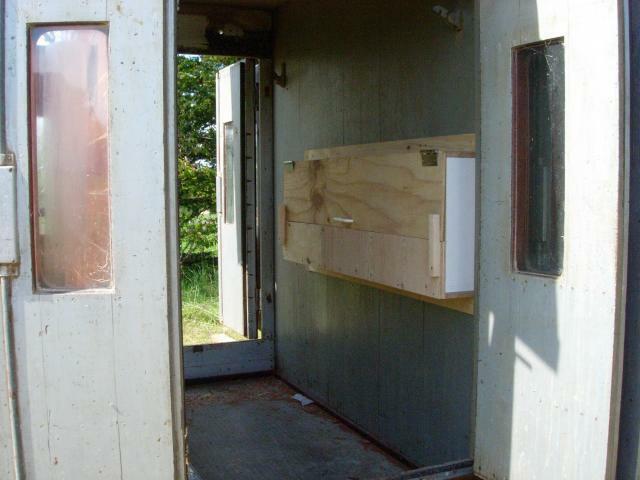 A photo of the type of incubator that it once was. 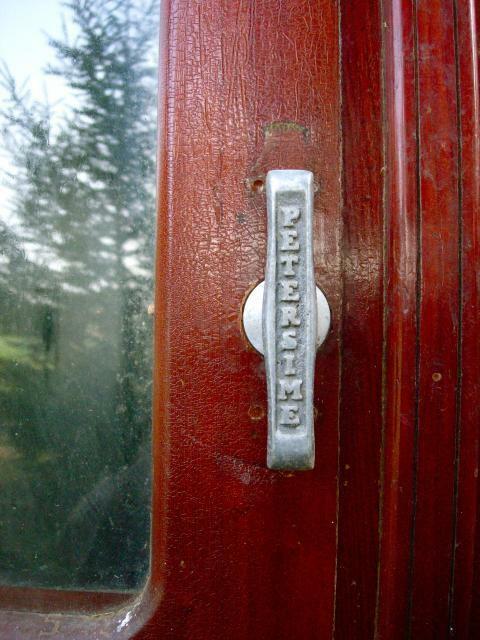 The door handles look like this. Cool! Rgpullin, hempsteadjb, 3riverschick and 7 others like this. This is a great job! Thanks for sharing. I love seeing something beautiful like this repurposed. One of the best DIY ideas I've seen on here. Kudos. Man, that's really cool and what an awesome deal for what you got quality wise. And yes please update us once you get your chickens situated. This looks awesome! We need an "updated" when the chickens arrive and get established in it. I love seeing new coop pictures - but it makes it even better when I get to see it with it's inhabitants Thank you for posting!! It's gorgeous! I just saw this! What a gorgeous building even before you started working on it! I love your changes/additions and can't wait to see pics of it in use! Man, this is so cool!!! I'll bet your flock just LOVES it!! That is so great!!!! Good job! That's great! I can't wait to see how it looks like with the chickens inside.